I just adore these cabs. She is so flirty and fun! 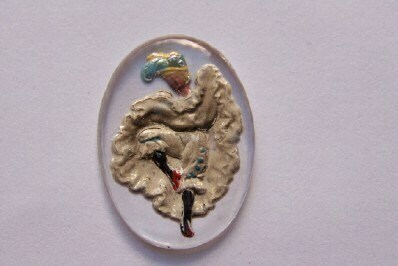 This is a vintage glass intaglio from Western Germany. There is a lot of details in this piece. The dancer has a blue ribbon around her uplifted leg and blue buttons down her other leg. She is wearing black stockings and red shoes. This is softly faceted around the edge. Some of the faces are darker than others on these pieces. The shading on the dress can vary a little from piece to piece. The pleats and folds can have a deep tint. This measures 30mm X 22mm. You will receive one piece. Sweet vintage glass fun, love them. This shop is great with unusual items at reasonable prices. Thanks. Wonderful stone with many osibiloties. Thanks! Great service and smooth transaction! Fun products!